Is she or isn’t she? That is the question. Brad Pitt and Marion Cotillard may be two of moviedom’s most exciting stars right now but they can’t seem to find their groove in this disappointingly dull period piece set during WWII. In ALLIED, Pitt plays Max Vatan, an officer in the RCAF (the “C” stands for “Canadian”, for those not familiar with acronyms from the Great White North) assigned to British Intelligence. At the start of the film, he is parachuted into French Morocco to join forces with French Resistance fighter, Marianne Beauséjour (Cotillard). Posing as a married couple in Casablanca, their mission is to assassinate the German ambassador at a gala event. While Max is all business, Marianne is as cool as a cucumber. She’s been in the spy game for a while and she knows what to do and what to say to fit right in. As Max quickly learns, Marianne has everyone in Casablanca completely fooled. Mission complete, the two fall in love, get married and move to London where Max takes a desk job at the SOE (Special Operations Executive). Marianne, meanwhile, is quite content to stay in their quiet, suburban home raising their young child who was born during an air raid. Their happiness comes to an end, though, when the SOE informs Max that they suspect Marianne of being a German spy. Is Marianne really a spy or are the SOE testing Max in preparation for a promotion? Max has just 72 hours to uncover the truth and, if Marianne is a spy, execute her. 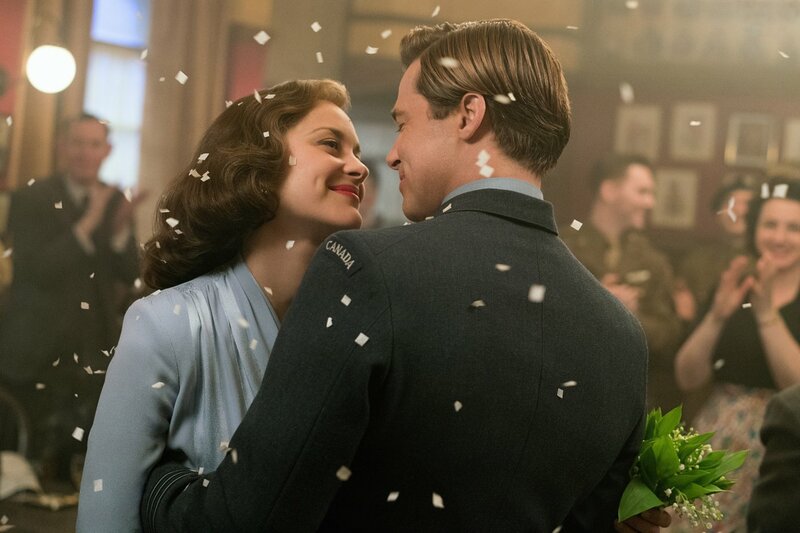 ALLIED is being billed as a wartime thriller romance – a kind of companion piece to the film, CASABLANCA (the events in ALLIED take place right after those in CASABLANCA), but the thrills just aren’t there and the romance is tepid at best. That’s both disappointing and curious considering the actors, director (Oscar® winner Robert Zemeckis, BACK TO THE FUTURE trilogy; FOREST GUMP) and screenwriter (Steven Knight, EASTERN PROMISES; LOCKE) involved. There has been much speculation in the media over whether Cotillard was the reason for the split between Pitt and his wife, Angelina Jolie. If any hanky panky was going on between Pitt and Cotillard off the set, the audience certainly won’t be able to sense it. On screen, these two actors can barely generate a spark between them. Sure, Cotillard looks wonderfully glamorous in her period dresses and hairstyle, and Pitt cuts a dashing figure in his uniform, but they’re definitely not in the same league as Bergman and Bogart. Even the fancy costuming and pretty faces can’t save the ennui that is this film. Perhaps ALLIED should have been more like INDIANA JONES and less like CASABLANCA. Some scenes certainly give a few nods and a wink to the 1942 classic, which is fine, but a couple of similar lines and a carefully tipped hat don’t make up for the film’s weak direction. Sadly, Zameckis fails to generate enough tension to keep us interested in guessing whether Marianne is a double agent or not. Also disappointing is the set design. For someone like Zameckis who is an innovative, technology whiz, there’s a distinct lack of creativity in the sets, which look cheap, fake and stagey. That being said, this is not a horrible film and audiences, for the most part, have been forgiving. It’s just not going to be an awards contender, and that’s a shame because it should have been a much better film than it is. ← Movie Review: Why Him?